What is the best small bread machine? The Zojirushi BB-SSC10 is our choice for the best small bread machine. Small family? No kitchen space? No problem! There are plenty of small bread machines that you can buy without finding an extra appliance cumbersome. As a matter of fact, if you consume bread regularly, we think it’s going to be one of the greatest appliances you ever got. When making this list, we not only wanted to find some small bread machine choices, we wanted to pick out the best of the best. We looked for how well each baked bread. How did the bread look? How did it taste? How easy was it to use the machine? We considered all the factors someone would look for in a bread machine, and came up with these great choices. The Zojirushi BB-SSC10 is hands down our #1 choice for small bread machine. This bread machine is one of Zojirushi’s newer models and considered an upgrade to the Zojirushi BB-HAC10, which was our #1 pick in the past and one of the bestselling mini bread makers for the past 15 years or so. So as you can imagine, an update was long overdue! The newer Zojirushi BB-SSC10 comes with cool features that the older model didn’t have. For starters, it has an auto-add dispenser for fruit, nuts, and seeds. And it now comes with dedicated courses for baking gluten-free bread, salt-free bread, sugar-free bread, and vegan bread to accommodate people with special dietary needs. Older machines simply baked “bread”. The times have definitely changed! This bread machine bakes a 1-pound loaf. It’s hard to beat the quality of bread from a Zoji machine so if you’re looking for the absolute best bread machine to accommodate smaller needs, this is the one! Check out our review of the Zojirushi BB-SSC10 here. The T-fal PF311 bakes a 1-, 1.5-, and 2-pound loaf so it’s perfect for singles, couples, and small families. 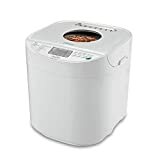 This is also a newer bread machine that T-fal released recently, and there are many settings on this bread machine including salt-free bread, sweet bread, and wholemeal bread. 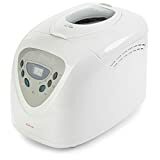 There are 3 gluten-free settings too (besides being one of our picks for small bread machine it’s also one of our picks for gluten-free bread machine). This is a versatile bread machine and, while it doesn’t have a dispenser or make as good a bread as a Zoji machine, this would be a good pick for budget-conscious bakers. The Oster CKSTBRTW20 has up to a 2-pound loaf capacity which is similar to the T-fal PF311. It weighs only 8 pounds and doesn’t seem as sturdy as the Zojirushi BB-SSC10. Still, this machine is a bestseller for a reason. It’s priced at about $70 and does a great job baking bread. It’s one of the best value bread machines out there. Even though it’s lightweight, it doesn’t “run around” the counter and is quiet. You can read more about its features here. This Hamilton Beach HomeBaker 29881/29882 makes a 1.5 and 2-pound loaf. It’s a little on the heavy side for its size as it weighs 15 pounds, but that also means it won’t walk around the kitchen counter when operating. It’s an awesome little machine that has an equally awesome little price tag. For those wanting a small budget machine to make gluten-free bread, you will be happy to know that it comes with a gluten-free mode. Although it doesn’t have a dispenser, there is an audible reminder for adding in fruit and nut. All in all, we think it’s good choice among small bread makers. The last bread machine we want to feature is the Sunbeam 5891. It bakes a 1.5 or 2-pound loaf. Some of the highlights of this machine are the large viewing window at the top, large LCD display, and an express baking setting that will bake bread in under 1 hour. However, the drawback of this machine is that it is heavy at 18.6 pounds. It’s one of the reasons we couldn’t put this machine at the top of our list. And even though it bakes bread well, we felt there were areas of improvement (read more here). For what it’s worth, the machine is still a good option for those searching for something small. Can you write review on Kenwood BM-250? many thanks!